I do not, like you, practice puppetry. I should say that I don’t anymore, for as teenagers, people of my generation and of the Bissa ethnic group I belong to in Burkina Faso had to build and manipulate their toys themselves. My friends today claim that I seemed to have a particular talent for it, which always set me above my playmates. Truth or flattery, I don’t know. It is especially the pleasure I experienced in making my toys that I remember from that time of my life, a sufficiently strong pleasure for me to accept being severely punished several times for having sacrificed doing some of my chores for it. This attachment to my childhood toys was certainly part of the enthusiasm I felt when, in 1984, Mr Jacques Félix suggested that I become the UNIMA representative in Upper Volta (today’s Burkina Faso). I knew I could no longer be a puppeteer. But I committed myself to doing everything in my power to assist the birth and development of this art form, practically nonexistent in my country at the time. The one exception was the work a French language teacher, Ms Grésillon (you see that I remember her name! ), who, from time to time, would teach her students at the Zinda secondary school how to make puppets out of papier-mâché. I undertook helping artists by using all the opportunities offered me by my professional theatrical life. I would especially send the best of my youngest actors to get training everywhere possible. Then, in order to assure a minimum of visibility to puppeteers, I transformed the Ouagadougou International Theatre Festival, which I founded and directed, into the Ouagadougou International Puppet Theatre Festival (FITMO). This gave puppet and actors’ theatre the same standing and offered puppeteers from French-speaking Africa and elsewhere, their first African festival. least bit concerned with the absurd controversy tending to oppose puppets and theatre. This distinction is all the more absurd in Africa, where a successful theatrical performance implies many other forms of artistic expression. Puppets have always been quite naturally present in my shows every time the need was felt, to the immense delight of audiences. Puppetry, as an autonomous form of artistic expression is as yet relatively unknown in Africa and insufficiently developed. Through the building and manipulating of toys, however, puppets have contributed a lot to the development of African Art. I remain convinced that African adults, whether they have had a Western education or not, would happily find the path of dreams and emotion again through a good puppet performance. 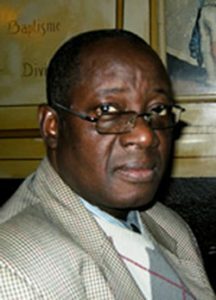 Stage director, dramatist, Burkina university professor and vice-president of the International Theatre Institute, he is the founder and director of FITMO, the Ouagadougou International Puppet Theatre Festival.